Blake Shelton is coming here!!!! come stay with us and go see him in concert! relax and enjoy, this cozy, beautifully decorated 1 bedroom log cabin, located between red light 9 and 10 in downtown Gatlinburg! Zip lines, shopping, restaurants and the entrance to The Great Smoky Mountain National Park is practically out of your back door! 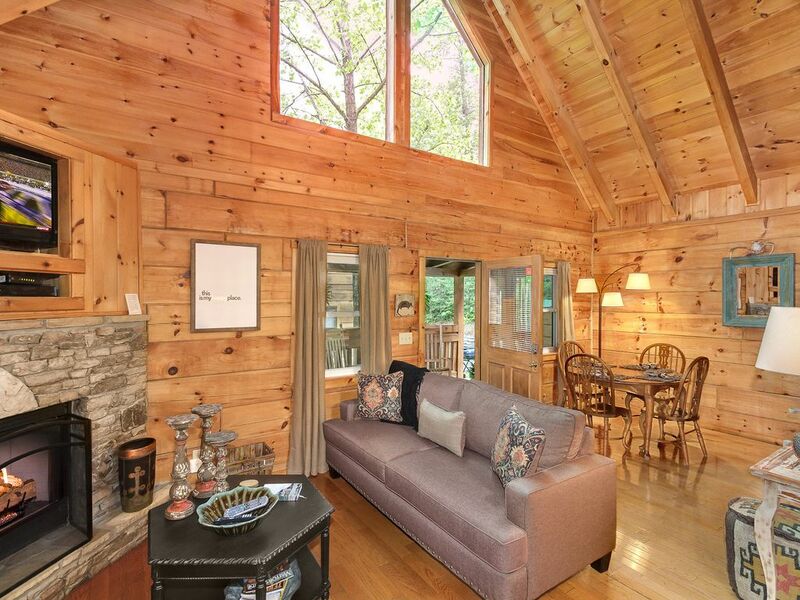 This log cabin offers wood inside and out creating a warm atmosphere with large beams and vaulted ceilings. The living room boast a full size sofa, stone gas burning fire place, flat screen TV with DVD,. The kitchen is exceptionally equipped with everything you need ,as well as a dining table with seating for four. The game room with a pool table for after dinner entertainment also host a futon/sleeper sofa that sleeps two. The deck provides a place to relax with a hot tub, bench, and rocking chairs for your enjoyment. One may also enjoy cooking out on the park style grill located just outside your door. Upstairs you will find a spacious loft which features a "sleep number" king size bed with premium linens, and a Jacuzzi tub for two. A flat screen TV has also been included to enhance your evening entertainment. Your stay here will be filled with great memories to cherish for years to come! Rett /Robbie and Ellen Hall , we are residents of Mississippi and have been for the most of our lives! our daughter Ellen is currently in college studying general business to take over the Hall family business! location, location, location!!! we have a chalet in the same neighborhood and love the area, so we decided to purchase another one! we fell in love with the closeness of town, the feeling of pure private, but still very close to town, as well as the coziness of the cabin! approximately 1/4 mile from downtown! we back up to The Great Smoky mountain national Park! Ober Mountain is across the street! perfect for honeymooners, couples with small children, as well as seniors! This cabin was just perfect for my little family! Good location... right in the downtown area. Thoroughly enjoyed our stay. Very nice cabin. Location is perfect for easy access to downtown, park, and restaurants. so gald you enjoyed it! The cabin is in a good location close to the Main Street in Gatlinburg. It is not remote or private though and there is no yard so if you are looking for that this is not the place for you. It is well appointed with everything you need, very clean, well decorated and overall we had a lovely stay. Only a few negatives. The lighting in the bathroom is very dim, hard to see, the pool table is in a room where it is a little too tight and the pool stick hits the wall. Again, it was a lovely stay. No problems at all. thank you so much, we will check on the lighting in the restroom. Nice little cabin that is very close to town. It’s almost like a little tiny cabin subdivision. It was clean and relatively easy to get to. The view is not very good, I was hoping for a better view. Also, the TVs are very small, so if you want to watch anything, like a football game, you have to be close. The sleep number bed was nice. We stayed for 5 days of perfect relation. The owners could not be any better at making our stay very unforgettable. The cabin is in a very quiet location just feet from the National Park boundary and very close to the Main Street of downtown Gatlinburg. If u want a perfect cabin for a relaxing vacation in the mountains then this is the place for u. The owners go out of there way to make sure u have everything u need to make ur vacation unforgettable. close to everything downtown Gatlinburg has to offer! Ober Mtn Tram, Ober Mtn ski, roaring river walk, sight seeing, dolly world.